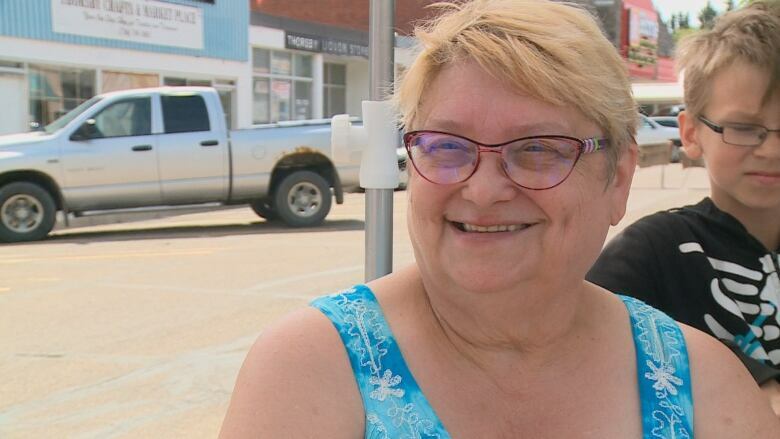 The main street in the town of Thorsby was shut down for a birthday on July 1 — but it wasn't just for Canada. The main street in the town of Thorsby, Alta. was shut down for a birthday on July 1 — but it wasn't just for Canada. Elsie Ecklund turned 100-years-old Saturday and to celebrate, the town shut down the main street. "Today, it will celebrate my 100th birthday and Canada Day together," Ecklund said Saturday. She said her daughter promised to celebrate her centennial by dancing in the street when she was 95 — but said she wasn't sure she could pull it off. "I said, 'Oh, come on, that's silly talk. Who's going to let you dance on the street?' " she remembers telling her daughter, Shirley Dool. But sure enough, Dool did pull it off — and generations of Ecklund's family members, including three great-great-grandchildren, danced in the streets with her. "I am so proud of my mom," Dool said. "The stuff that she has gone through in her lifetime, she's a strong woman. A weak woman would have never survived." Ecklund was born in Siberia in 1917 and has lived in Alberta since 1929. She's endured two World Wars, the Great Depression and everything in between. Since her residency in Thorsby, Coun. Rick Hart said she's well-known in the community. "She's become an icon in town," he said. "Here we are today, celebrating Canada's 150th birthday, and Elsie's been around for two-thirds of that." And as she celebrates her 100th birthday, she's also equally proud to be living in Canada. "All I can say is be happy that you are in Canada," she said. "I travelled a little bit to different countries, but this is the best country."